RESPONDING to the news today that the Faroe Islands has decided to follow Iceland’s lead and declare a massively increased mackerel quota for this year, the Scottish Fishermen’s Federation is urging the Faroese to reverse their decision and rejoin the previously operated international regime of sensible, sustainable and rational fisheries management. Last year Iceland declared their intent to unilaterally increase their North-East Atlantic mackerel quota for 2010 to 130,000 tonnes. Now the Faroese have followed suit by setting their own autonomous quota of 85,000 tonnes for this year. Bertie Armstrong, SFF chief executive said: “It must not be forgotten that the origins of this lie in Iceland deciding to unilaterally set their own quota far in excess of any international agreement and outside any safe parameters for the sensible management of the mackerel stock. “It is astonishing that the Faroese have decided to join Iceland by following this same ruinous path, given that such an increase in catch uptake could have serious implications for the sustainability and overall health of the mackerel stock. “For the last 30 years the Faroese have a good track record of forming bilateral agreements with the EU and others for the sensible and rational management of north-east Atlantic shared fish stocks and we are astonished that they seem to be putting all this in jeopardy by this irrational decision. “We urge the Faroese to come back into the fold of sensible fisheries management that they have been part of for the last 30 years. Otherwise there could be serious consequences for international fisheries management that will damage all stakeholders. “As far as Iceland is concerned, we are of the firm view that their action should impact upon their plans for accession to the EU. No country should be allowed into the membership of the EU that cannot demonstrate its ability to behave within reason. Mackerel quotas set by the Faroe Islands and Iceland governments could be "disastrous" for the Scottish fleet, it has been claimed. Fisheries Secretary Richard Lochhead warned their quotas were "short-sighted and selfish". It followed the Faroes declaring a quota of 85,000 tonnes for this year. Previously, Iceland awarded itself 130,000 tonnes. Mackerel is the most valuable stock to the Scottish industry. Mr Lochhead said: "Scotland is at the fore of promoting responsible, sustainable fishing practices therefore these unacceptable actions are deeply frustrating for Scottish fishermen. "Mackerel is one of the most sustainable fisheries thanks to the action that Scotland and other EU member states have taken to successfully manage stocks. "This is now being put at risk by the irresponsible actions of Iceland and the Faroes." Bertie Armstrong, chief executive of the Scottish Fishermen's Federation (SFF), said: "It is astonishing that the Faroese have decided to join Iceland by following this same ruinous path. "Such an increase in catch uptake could have serious implications for the sustainability and overall health of the mackerel stock. "We urge the Faroese to come back into the fold of sensible fisheries management that they have been part of for the last 30 years." He added: "Provisional figures show that in 2009 mackerel was worth £135m at first sale value, which represents a third of the value of landings by the Scottish fleet. "Such an important sector of our fishing industry must not be jeopardised by the irresponsible actions of other nations." UK Fisheries Minister, Richard Benyon, has added his voice to the mounting concern over the decision of the Governments of Iceland and the Faroe Islands to award arbitrary fishing quota for Mackerel. At the end of July, The Faroe Islands set a quota for mackerel of 85,000 tonnes for this year, which is 15 per cent of the recommended global total allowable catch and far in excess of their previous four per cent share. This follows a recent decision by Iceland to declare themselves a quota of 130,000 tonnes. This level of fishing is likely to have a detrimental impact on the fishery and undermine the sustainability of the stock. The UK has made its position clear to the European Commission. Richard Benyon, UK Fisheries Minister, and Richard Lochhead, Scottish Fisheries Secretary, have written to European Fisheries Commissioner Maria Damanaki to raise their shared concerns. Both Ministers welcome the recent announcement by the Commissioner voicing the EU objections to the actions taken by Iceland and Faroe Islands. ICELAND is continuing to defy the European Union and Norway over its controversial mackerel quota with two of its main fishing companies announcing maximum effort. In fact one of them, Samherji, has brought the 7,800 ton Kristina EA, the largest ship in the Icelandic fishing fleet up from the Canary islands to hunt for mackerel and herring in Icelandic waters. Kristina (previously the Engey RE) came in to the ownership of Samherji three years ago and has been on hire since then, fishing off the shores of Africa. The Captain of Kristina EA is Arngrímur Brynjólfsson and his crew counts 35. The ship is equipped with powerful and highly technical processing and freezing machinery and the catch will all be processed on board. Meanwhile, HB Grandi's pelagic fleet is back in the hunt for mackerel and herring after a short break. All three vessels stopped fishing recently to fit in with the Vopnafjördur factory’s break in production and are back at sea now to have raw material for production to resume next week. So far this season HB Grandi’s pelagic vessels have landed 7300 tonnes of Atlanto-Scandian herring, with 23,000 tonnes remaining of their quota. The company says that catches of mackerel have been heavier, with 11,150 tonnes landed so far, leaving 4,400 tonnes of the quota to be caught. Up to last weekend the total catch by Icelandic vessels was 75,000 metric tons, 58 per cent of its self declared quota of 130,000 tons. The Faroe Islands have also given themselves a quota of 85,000 tons, much to the anger of the EU. Yesterday the Scottish Fishermen's Federation urged the Faroese to give up the quota. The Icelandic Fishing Vessel Owners Association has said that its country has “every right to fish for mackerel within the Icelandic jurisdiction” just as Norway and the EU have the right to fish for mackerel in their respective jurisdictions. 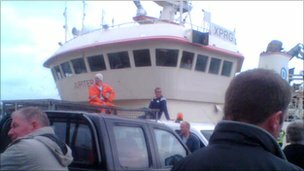 FAROESE fishermen bidding to land mackerel at Peterhead today faced another angry protest at their country’s stance on mackerel quotas. The pelagic vessel Jupiter has returned to the port despite the storm of protest which affected a previous visit, but it is understood that the 1100 tonnes of mackerel on board is destined for a different Peterhead processor than the firm involved in the last protest at the port. Today's protest is again underlining the anger among Scottish pelagic fishermen over the Faroese and Icelandic decision to award themselves substantial mackerel quotas in defiance of both the EU and Norway. And it is understood that if the mackerel landings go ahead, the Peterhead purchasers could find difficulty bidding for mackerel on a Norwegian auction site in future, given Norway’s anger over the unilateral quota issue. Ian Gatt, chief executive of the Scottish Pelagic Fishermen's Association who was at the scene said that the action by both Iceland and Faroe was exacerbated by the Faroese vessel's attempts to land at the top port. And he said the quayside action was a symptom of the frustration felt by Scottish fishermen over Scotland's most important pelagic species being "threatened at its core." Peterhead and Fraserburgh skippers as well as some workers are understood to be involved in today’s protest and one eye-witness said the protesters were blocking access to the Faroese vessel in what however was being described by fishermen as a peaceful protest. Police were also at the scene. Dozens of fishermen have created a quayside blockade to stop a foreign vessel landing a haul of mackerel. The workers at Peterhead are preventing the Faroese boat Jupiter from landing 1,000 tonnes of the fish as part of an escalating ‘mackerel war’. The argument centres on the decision by the Faeroe Islands and Iceland to catch around three times more than the EU deems reasonable. Tuesday’s action comes just weeks after a similar blockade was set up at the same Aberdeenshire harbour, again to block the Jupiter from landing around 900 tonnes of mackerel. On that occasion the blockade was broken up after the local fishermen were given assurances that it would be the last time such a landing would be made there. A large police presence is on site in Peterhead. Scottish Fishermen's Federation President Ian Gatt is meeting with the skippers to discuss the next step. It is understood the Jupiter was due to land the catch with Peterhead fish processors Fresh Catch. The EU could be set to introduce sanctions against the countries in a throw back to the cod wars of the 1970s. Possible action could see Faroese and Icelandic boats barred from landing any catches at EU ports. Iceland insists its fishermen are permitted to catch any fish it wants within its 200-mile territorial limit. Norway has already banned boats from the two countries from landing at any of its fish processing plants. A Faroese fishing boat has been prevented from offloading its cargo after being blockaded by fishermen in Peterhead over a mackerel wrangle. The Jupiter was met by dozens of protesters at the harbour in the early hours of the morning. The skipper, Emil Pedersen, said it was a "very bad situation" to be in. Mackerel quotas set by the Faroe Islands and Iceland governments could be "disastrous" for the Scottish fleet, it was warned last week. The Faroes has declared a quota of 85,000 tonnes for this year. Previously, Iceland awarded itself 130,000 tonnes. Mr Pedersen, 38, told the BBC Scotland news website: "We have fish on board which is good for human consumption." Of the blockading fishermen, he said: "This is not their job, this is a political matter. "They seem to be peaceful, but they are stopping us from working, and I think they should not be allowed to do that. "It's very strange that the police cannot stop this." Chief executive of the Scottish Pelagic Fishermen's Federation, Ian Gatt, said: "The protest has been very peaceful but the guys are very angry." everything aside-isn`t this what we all aspire to-being in the position to control our own industry and being fit to set our own quotas? Up to a point thats right but the difference is that Mackerel is a migratory fish and its only the strict regulations the EU has had in place over the last few years that has let the stock increase in size to the point its now in large numbers in Faroes and Icelandic waters. Its called a straddling stock and Faroes and Iceland have legal obligations to negotiate for access not just catch whatever the hell they like. Let me just say one thing first this is NOT the fishermens fault. If our fishermen were told to go and catch fish by the government/EU they would and wouldn't think anything about it so I can't blame the Faroes and Icelandic fishermen ( ok the Icelandic companies were putting pressure on their government to set a large quota , it was the government's duty to stand up to them and respect international law and rules however ). The Jupiter sailed from Peterhead without landing late last night , she was passing Sanday , Orkney , at 8 this morning so must be heading back home to land.